We've divided the anatomy of the human muscular system into three major sections. First are the full-body muscular figures, ranging from life-size to desktop. 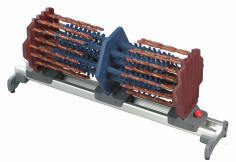 These also show the internal organs of the human body. 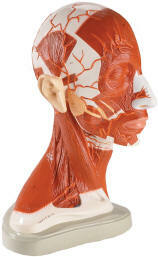 This is followed by the muscles of the human head. The largest section deals with the extremities and joints. It's so big that it has its own menu. You'll find a page dedicated to human arms and another to human legs, plus a page for each of the joints: shoulder, elbow, wrist, hip, knee and ankle. Because of their interdependence, the wrist and ankle pages also contain models of the human hand and human foot. 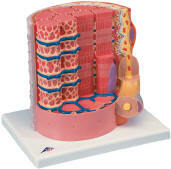 In addition to muscles, these models also show bones, blood vessels, tendons, and nerves. 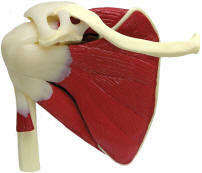 Many of these anatomical models are extremely helpful in patient education, physical therapy and sports medicine.